Catholic Christian Homeschooling: What's wrong with being quiet and polite? What's wrong with being quiet and polite? It's funny the things people say to you about your own children. 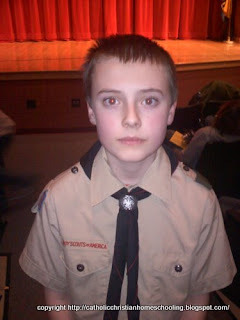 Superstar has joined boy scouts recently. Well, at first he was in cub scouts, but just bridged over this passed weekend to boy scouts at the annual blue and gold banquet. As preparation for the banquet the boys were invited to go to another scouters house to decorate cupcakes. It was an open house type event -- just show up whenever you can between 5-7. It was decided I should take him because the host was another homeschooling mom and we thought it would be nice for me to able to meet her. It was nice to meet her! Anyway, when we showed up and all the boys that were there were already downstairs playing games, because they had already decorated their cupcakes. As soon as we arrived Superstar washed his hands, decorated his cakes, rewashed his hand, and then walked up to me and said "Okay I'm done, we can go". I then said to him "Well, didn't you want to go downstairs and say hi to the other boys?" He looked at me and said "Oh, okay" and then asked our host if it was okay? She said sure go ahead. Clearly Superstar didn't catch the other parents mentioning how the boys were downstairs playing because they already decorated their cupcakes. Another mother, not our host, said "Superstar is always so quiet and polite. We really need to break him out of his shell?" I really didn't know how to respond to that, other then to give an awkward little chuckle and smile and say "Yes, he can be a bit quiet at times". I've been thinking about these words from some time and I really don't know why being polite is such a horrible thing! I will admit that when he doesn't know someone or at a new place he can be a bit quiet, but when he gets to know you he opens up more. I think that's normal. I wouldn't have given much thought if this mother only mention the quiet part, but given she mention in being "polite" too, I'm taken back the whole thing. Are kids 10-11years of age no longer polite? Is it no longer acceptable? I get the same types of comments about my 9- and 10-year old girls. Yes, apparently, it's abnormal to be polite! It bothers me, too, when people comment about the girls' "shyness;" they are actually not shy, just a bit cautious in new situations, and I think that's a good thing and encourage it since I know they will warm up as soon as they feel comfortable. As for the politeness thing, I will happily have them be weird rather than fit in with the norm in that regard! You were too nice to that lady, though; I think I would have let my astonishment show and said, "Oh, since when is being polite something to change?" and then let her squirm on that one. That comment makes me groan as well, and squirm. Introvert vs. Extrovert. I'm an introvert, and I need my alone time! I'm more cautious in social situations, but will warm up when comfortable. The same thing with one of my children!